Problem with NetRadiant - shadertags.xml. No tag support. Xonotic Forums Support Xonotic - Help & Troubleshooting [SOLVED] Problem with NetRadiant - shadertags.xml. No tag support. [SOLVED] Problem with NetRadiant - shadertags.xml. No tag support. Hi. I have a problem with the program Netradiant. Unable to find default tag file D:/xonotic-0.6.0-mappingsupport/Xonotic/mapping/netradiant-1.5.0-20120301/xonotic.game/shadertags.xml. No tag support. How did you set up NetRadiant? Did you follow some guide? To get netradiant, scripts, maps, textures... (if you don't have them yet or sth is wrong) go to http://beta.xonotic.org/autobuild/ (login: xonotic, password: g-23) and download lastest mapping support. (05-05-2013, 12:48 PM)Mr. Bougo Wrote: How did you set up NetRadiant? Did you follow some guide? How I set it up was in the .zip it had the Xonotic folder structure. The only thing you have to do is extracting the textures to /home/user/.xonotic/data/. There is no need need for setting up a shadertag file nor you have to copy over any original shaders. NetRadiant ONLY needs the TEXTURES as it says in the replacer images: "shader image missing"
(07-26-2013, 06:00 AM)Maddin Wrote: The only thing you have to do is extracting the textures to /home/user/.xonotic/data/. There is no need need for setting up a shadertag file nor you have to copy over any original shaders. NetRadiant ONLY needs the TEXTURES as it says in the replacer images: "shader image missing"
You simply need to extract the textures directory (you can find it in Xonotic/data/xonotic-20130726-maps-mapping.pk3) of the mapping support package to /home/user/.xonotic/data/. Unable to find default tag file C:/Users/my user name/Saved Games/xonotic/mapping/netradiant-1.5.0-20120301/xonotic.game/shadertags.xml. No tag support. As I said above you do not need to set up the shadertag file, it´s redundant. As long as you see the textures it´ll be all fine. The path "/home/username/.xonotic/data" is equivalent to "C:/Users/username/Saved Games/xonotic/data" on Windows. I have downloaded the video and i'll see what I can do. Different how, in appearence or in functionality? It's not the same operating system, so windows are rendered differently, but the contents of the windows and their functionality shouldn't differ from one OS to the other. That´s right Mr.Bougo. My icons in NetRadiant are also different but their functionality remains the same. Things like file manager should be pretty self explanatory. Remember though, that the paths are different on Windows as I explained before. (08-06-2013, 02:56 PM)Mirio Wrote: Download 0.7 anyway! Right the problem is that I need to find the menu with the textures. @Mirio: It´s totally irrelevant which version of Xonotic is in use. @satuim: What exactly do you mean by "menu"? 1) Make a screenshot of your editor and post it here so we can see the differences. 2) You should reread my instructions I gave you before. That means: Watch the video on how to get the textures and apply them. The paths are different on your OS so use the one I gave you ("C:/Users/username/Saved Games/xonotic/data"). 2) I have done the textures bit right. But where does NetRadient go? That´s up to you where you put NetRadiant. Looking at your screenshot it seems that something else is the problem. 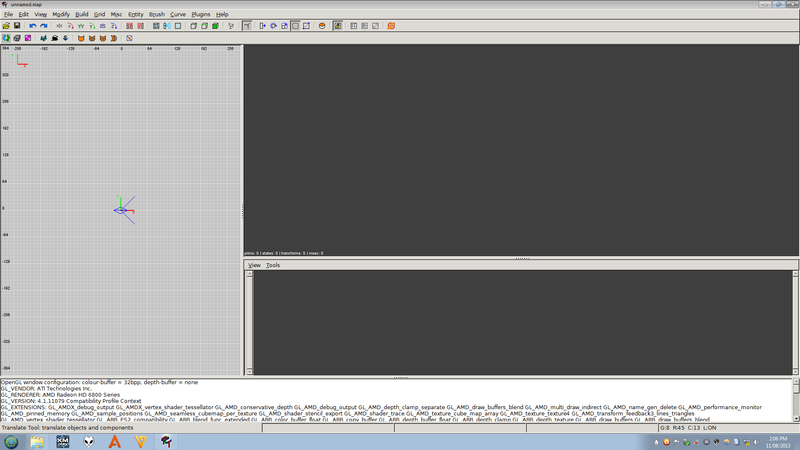 The texture list is completely empty it seems or do you have to resize it to see it? If there is nothing, then you should check your paths in NetRadiant to the game executable etc. 1. In NetRadiant, you need to click on the texture item in the texture menu for it to actually load and show. Before the click, it would say "Shader not found". My setup is Arch Linux x86_64. I assume in Windows NetRadiant can also unpack *pk3 on the fly.